I think we have enough yays to make this official so let's get started. Any medium is fine, mixed medium, whatever you want to use to get it done. Susan Mulno, leighann and bbbaldie like this. I finally got started on mine today...will post a progress pic soon. I still haven't picked a medium. Flowers are my thing. I can't wait to start. 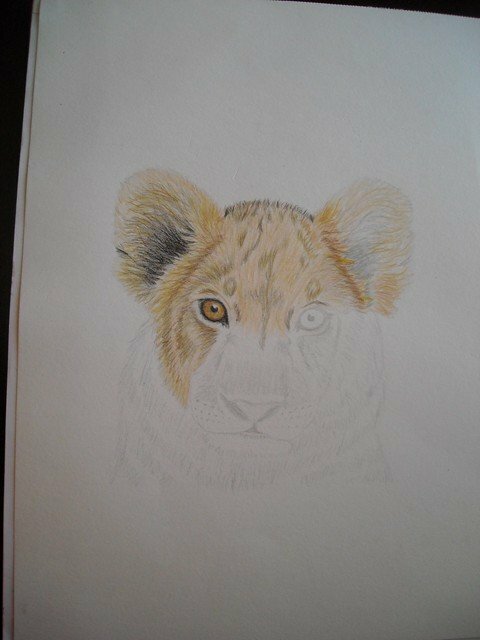 I'm just about finished with my lion painting. I'll probably have it done today or tomorrow. Then Hubby and I are going off on a cruise to celebrate our 50th wedding anniversary. Darn I'm old! I already posted this in painting and Susan suggested I post it here so here it is im calling it daffodils for some weird reason. Susan Mulno, leighann and dickhutchings like this. My favorite quote "I'll be back"
Location: In my motor home, full time for 12 years now. This is what I have so far, this is an involving challenge for me, hope I'm up to it. leighann, dickhutchings and bbbaldie like this. Grateful to Jesus for everything! Thank you Ken, yours too! I wonder if I could transform my abstract into a spring flower thing. Hmm. TerryCurley, Susan Mulno, leighann and 1 others like this. That's using your artistic noodle Meli! Love it!